Ring of Honor announced on Friday night that Davey Richards has signed a contract renewal with ROH and he will be appearing on ROH's WrestleMania weekend shows in Phoenix, Ariz. on March 26 and 27. Dragon Gate USA executive Gabe Sapolsky posted on Twitter around the time of ROH's announcement that Richards has been pulled from all DGUSA and EVOLVE events going forward. 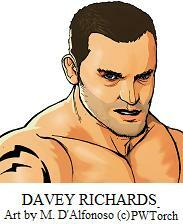 "Effective immediately Davey Richards has been removed from all DGUSA and EVOLVE events. I have been advised not to make more comments now," Sapolsky said on Twitter. DGUSA announced earlier this week that Richards was booked to challenge DGUSA champion BxB for the DGUSA Title at the promotion's March 26 show in Phoenix. Sapolsky was also building the new EVOLVE promotion around Richards after Bryan Danielson was initially to be the centerpiece of the promotion before he signed with WWE. ROH emphasized in their press release that Richards is the first wrestler announced for both of ROH's WrestleMania weekend shows. Richards is also booked for the next ROH TV tapings on Feb. 5 and 6 where he will be in the TV Title tournament to determine ROH's first-ever TV champion, he's also booked for New York City on Feb. 13, and the Charlotte, N.C. debut on April 3.